LANSING (MIC) — Members of the General/Jurisdictional Delegations of the Detroit and West Michigan Conferences endorsed the Rev. Kennetha Bigham-Tsai and the Rev. Laurie Haller as their episcopal nominees at their February 20, 2016 meeting here. “From the beginning, we surrounded this process with prayer,” noted Jackie Euper, lay delegate and vice-chair of the Detroit Conference Delegation. “I feel like God was in the decision.” Euper cited the two women’s history of engagement with the global church—Haller with Africa University and Bigham-Tsai with the Connectional Table–as pivotal in their endorsement. The Rev. Laurie Haller is currently serving as the Senior Pastor, First United Methodist Church, Birmingham, Michigan, appointed there in 2013. She was the Superintendent of the Grand Rapids District, West Michigan Conference, from 2006-2012. Other appointments as pastor in West Michigan Conference First UMC Grand Rapids; Aldersgate and Plainfield UMCs; Hart UMC; Ludington UMC (associate) and Ogdensburg UMC. Ordained in the Mennonite Church in 1982, her credentials were transferred to West Michigan in 1987. Haller received her Master of Divinity and Master of Music at Yale University. She was elected to the General Conference Delegation for West Michigan in 2016, 2012 (chair), 2008, and 2004 and was an alternate in 1996. In the year 2000 she was a delegate to the North Central Jurisdictional Conference. From 2004-2012 Haller was a director on the General Board of Higher Education and Ministry and during that time led an effort to raise $500,000 for a retreat center at Africa University. Haller blogs weekly at Leading from the Heart. Find her full biographical statement here. Ordained in 2009, the Rev. Kennetha Bigham-Tsai at present serves as the Superintendent of the Lansing District of the West Michigan Conference. Previous appointments in West Michigan include Kalamazoo: Milwood UMC and East Lansing: University UMC. She directed the District Peace With Justice Community in Grand Rapids from 2002-2006. Bigham-Tsai received her Bachelor of Arts at Harvard University and Master of Divinity from Austin Presbyterian Theological Seminary. A delegate of the West Michigan Conference to General and Jurisdictional Conference in 2012, Bigham-Tsai is a delegate to the 2016 North Central Jurisdictional Conference. Since 2012 she has offered significant leadership on the Executive Committee of the Connectional Table of The United Methodist Church. A link to her full resume is offered here. Her website is found at BighamTsai.org. A five-month process led the Michigan delegates to the interviews of four candidates on Feb. 20. In the fall of 2015 the West Michigan and Detroit Conference delegations agreed to move forward together on episcopal endorsements. A task team made up of persons from both sides of the Area and led by Alex Plum designed the nomination process that was then confirmed by the combined delegation. The process was informed by guidelines from the North Central Jurisdiction. A single vote among the 23 delegates present was taken following interviews on Feb. 20. When tallied both Haller and Bigham-Tsai received a majority. 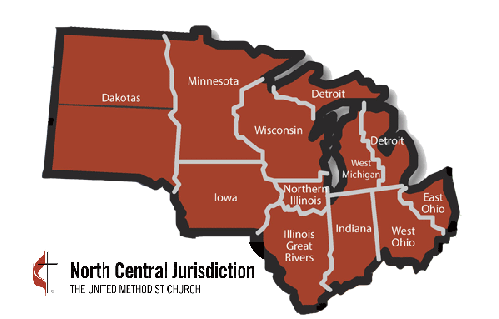 The Jurisdictional Conference will be held in Peoria, Ill., July 13-16, 2016. Four of the NCJ active bishops have announced their retirements following the 2016 jurisdictional conference: Michael Coyner (Indiana), John Hopkins (East Ohio), Jonathan Keaton (Illinois Great Rivers) and Deborah Kiesey (Michigan). Following the election of new bishops, assignments will be made of all newly elected and continuing NCJ bishops to the nine episcopal areas across the Upper Midwest. Assignments will be effective September 1 for the following four years.